Musco and Guthrie talk with Daniel Erickson and Damon Schubert. They discuss things from Patch 1.2 and also things to look for in Patch 1.3. For more information about the podcast and what you can hear on it read up on the post by Eric Musco. In the thread you can also voice your opinions and ask questions for future shows. Check out the podcast “Rocket Boots” in the video below. Carla and Deirdre are back at podcasting! Carla was able to get the podcast processed with her MacBook Pro as a fill-in till her “real” computer is fixed…Just kidding please no hate mail from the Mac community lol. So if you haven’t listened to “Episode 55: We’re BACK!” yet, be sure to download it from iTunes or Zune by subscribing to the podcast. Now, I am one for trying to do things on my own, but sometimes there are times I just get completely stumped and need some help. The community has so many great folks out there not just playing the game, but taking time to write up and even record guides for dealing with various obstacles in the game. I found Commando Trooper’s guide yesterday, and no I am not to the point of needing it…yet. Anyway, I was looking it over the site, expecting it to be just a link to video, but found a whole write up for the encounter with Warlord Kephess, in the Operation Explosive Conflict. Not only does Accomp, the author of Trooper Commando, make suggestions on how many of each role for your Operation group, but he also writes in great detail about the various game mechanics used in the fight and how they vary on each of the difficulty settings. 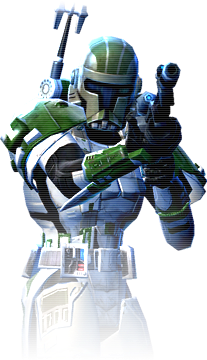 If you and your guild are gearing up for the Explosive Conflict Operation, I would highly recommend checking out Trooper Commando’s article and videos ahead of time (below is one showing the battle in Story/Normal Mode). In fact, check out the whole Trooper Commando site for some great tips on different bosses and also some of his other articles, ranging from code giveaways for Tauntaun Fawns, to an article about Best in Slot gear. You can also follow him @TrooperCommando on Twitter. This week Dimbo has posted the next segment, Taris part 13, in his on-going fan fiction story. We catch up with Dimbo the Trooper as he is on the search for serum for the Rakghoul Plague. This seems like a pretty straight forward mission once he learns about a possible location for the illusive serum. Of course it is never that simple, but then again we are talking about a plague that turns those infected into near mindless mutations…why in the heck did we assume it would be easy anyway? As far as the writing, Dimbo does another great job of putting the reader right there in the story and setting, not to mention the tough decisions Dimbo has to face. I know I have mentioned Dimbo’s writing and story before, but it really is such a good story. His ability to write some much into such a relatively short part each time still amazes me. If you have not read any part of this story, I urge you to check out the link to his latest part and you will be hooked. Below is a small excerpt, enjoy! I followed the light down the hallway it was nice, carpeted and had been well kept. Someone was here and it wasn’t rakghouls. I came to a door with an entry pad on the wall next to it. I was about to get out my slicing kit when I thought, I wonder… I pressed the enter button and the door opened up, no one was supposed to be here so why would they lock the place? Just when I think there is no way I am going to find something new for a SWTOR music video the community always comes through. This one is set to the tune “Down in the Boondocks” by Billie Joe Royal. There are some of you that have probably not heard this song. It is an older song, and yes it is even before my time lol. That said it is a song with a story about a boy born into the wrong social class in order to be with a particular girl. The video creator, Three60Crusader, took this idea and applied it to the mindset of the Sith. It fits the slave boy Inquisitor trying to “impress” a certain Pureblood Sith female goes right with the social class differences…all be it in a setting far, far away. If you come across a unique video or have created one yourself please email me at jason@corellianrun.com. I love sharing the great creativity found in the SWTOR community.